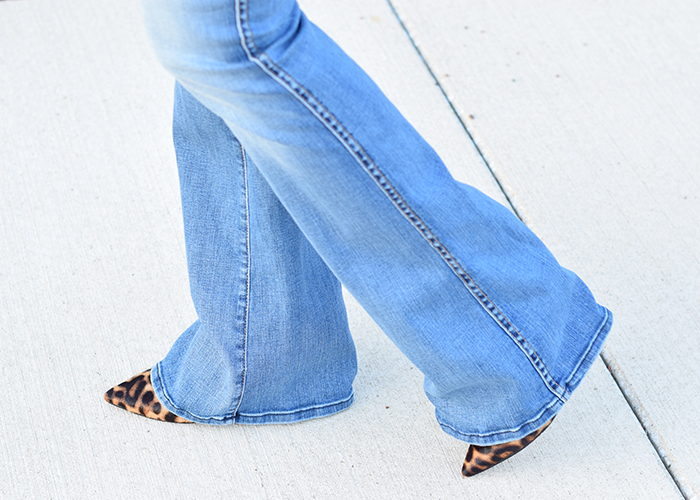 I am back wearing my flare jeans again! I love the higher waist and look of flare jeans. My suggestion is that if you are going to buy one new pair of jeans this fall, I would recommend buying a pair of flare jeans. If you are little skeptical about the bell bottom shape, you could try a slightly flared bootcut. It gives a slight flare, but not too much. One big point to mention is the hem length. Mine in these photos is a slight bit too long - you want them to graze the ground, but not rest on the floor. Also, you do not want to go the opposite - and too short. There is nothing more unflattering than high-water flares. The good thing about flare jeans (that skinny jeans do not do) is they elongate your legs, especially when you buy a higher-waisted pair. Also, I have to mention that my "favorite" yellow or mustard-colored cardigan is only $25! I also love this rust color. These would be perfect for layering this fall. I have linked some budget-friendly flare jean options below. I just might buy these - I like the darker wash.
Also, some budget-friendly mustard-yellow sweaters for fall. This one is my favorite. *Participating in the following link-ups. You look amazing in these flare jeans, and I love the color of that sweater. I have been in love with all things warm toned this season. Thank you! I love warm tones, too - I think I am so ready for fall! I'm sorta loving the return of flared denim- and these look amazing on you, doll! Love the flares! I agree about the higher waist being more flattering, especially on flares. LOVE this look! that sweater is perfect for fall, I might need it! I love this sweater on you and I agree that flares do amazing things for our legs! Ha! Even your blooper picture is gorgeous. That F21 sweater/cardi/wrap is gorgeous!! What a perfect fall color. Butternut squash or butterscotch. And now I am hungry. Hmm I have a mustard colored cardigan I may just have to copy this outfit :) Now to get some flared jeans to really rock it! I'm so in love with this mustard shade! Beautiful outfit! This styling is sooo on point, Lisa! I love the colors and those flare jeans fit you like a glove. 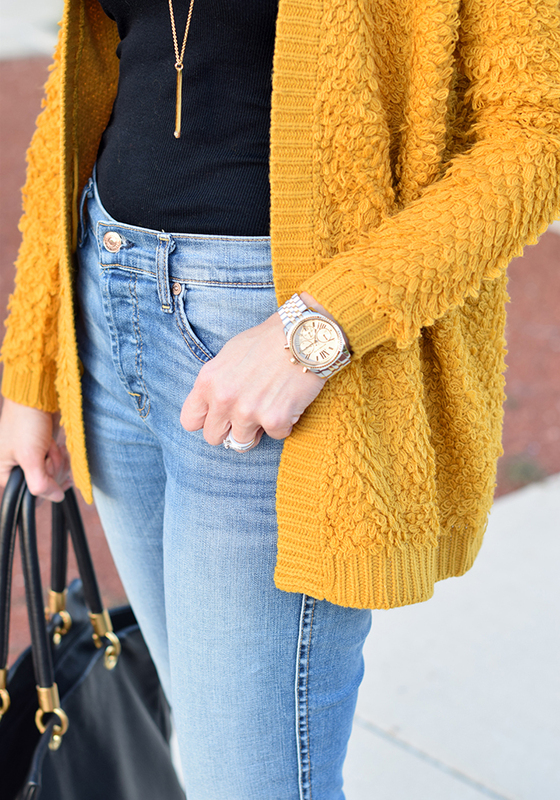 Gorgeous and I love the mustard cardi with it, such a color for this fall! The flares look great on you! Love the color of your sweater! I LOVE this outfit! 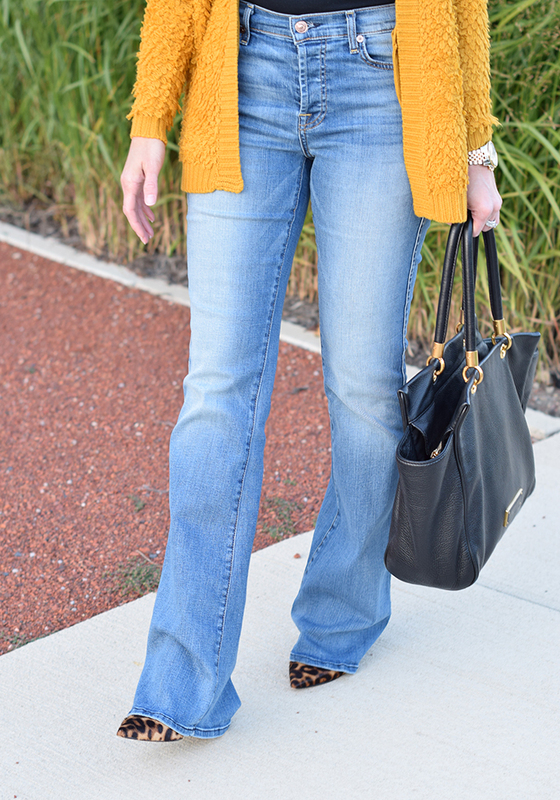 I am doing mustard yellow with bootcut jeans on my blog today, so when I saw your link on More Pieces of Me, I hopped over. Super cute and those leopard pumps are DIVINE! That color cardigan is gorgeous! I love this look. You're rocking this flared jeans! So fab! I loveee your cardigan! I bought one like it last year at Forever 21 as well, and have been dying to wear it again! I truthfully reach for it every day until I remind myself that its still in the 70s and that would be just too warm. I don't think I'll get flares but you never know! Love the whole outfit! From the cardi to the shoes! Really glad that you linked up with the new "My Refined Style" monthly link up. We are thrilled that you did. I am thrilled to have found your very stylish blog through the link up. So happy that I did! Hope to see you at next months link up. In the meantime I have a Monday fashion link up called SHOE AND TELL, so make sure to stop by and link up your entire outfit or just your fabulous shoes! I love the flares and yellow cardigan! This is a perfect fall look! I'm so glad that flares are back and really like how you styled these. Color of the cardigan is beautiful, perfect for the fall.